Here is my card for this month's Where Creativity Meets C9 challenge. This month we have a color challenge and they have selected a beautiful fall palette. I was excited to use the brand new Cozy Christmas stamp set. I chose inks from Gina K. Designs for today's card. The large sentiment is from the Seriously Thank You set from Concord and 9th. I can hardly wait to use the Cozy Christmas set again. I have the dies also and there are so many possibilities! Be sure to check out this challenge and add your own creation to the mix. Have a great day and I'll see you again tomorrow! What a warm and cozy card! 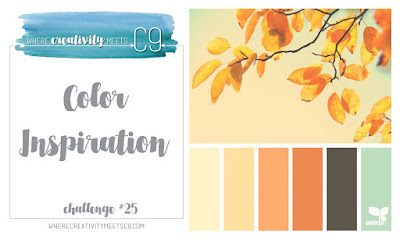 Thanks for playing along in the Where Creativity Meets C9 challenge!